Nepali people are in need of democracy with food, clothes and shelter – Prime Minister Oli - Integration Through Media ....! Prime Minister KP Sharma Oli has said the Nepali people were in need of a democracy that ensured food, clothes and shelter with full humanity. He said this in an interview to a group of Nepali journalists, including the journalists from the private media who are in New York to cover the 73rd UNGA and journalists from the state-owned media who are included in his delegation and those working in the US itself. Prime Minister Oli is in New York at the head of the Nepalese delegation taking part I the 73rd United Nations General Assembly. The Prime Minister is scheduled to deliver a statement to the UNGA on September 27. 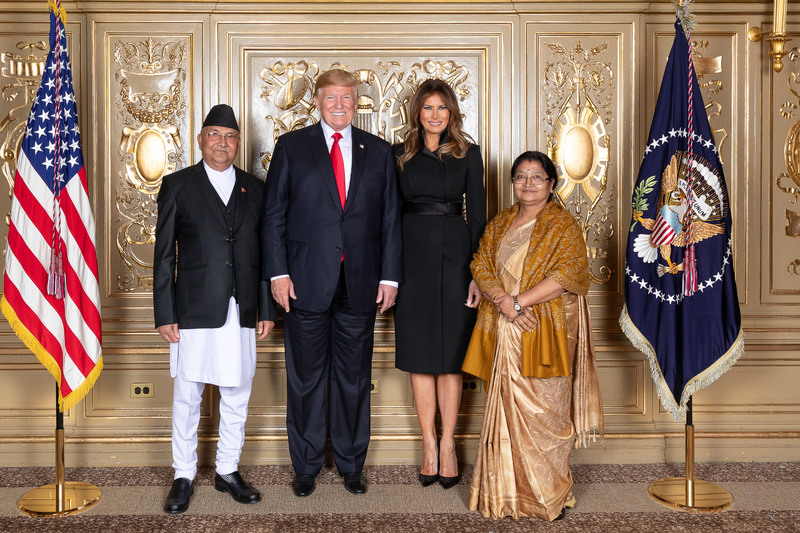 Stating that Nepal’s situation when he visited America last time and now was very different, PM Oli said the objective of his visit this time around was to inform the world about the achievements made by the Nepali people and to mobilize the international community’s support for the progress of the Nepali people. The Prime Minister also said the goal of the United Nations would be determined by the UN Charter and the thinking of the Secretary-General and the President of the UNGA, adding he was for rationale criticism. What is your feeling coming here in the capacity of Prime Minister this time? When I came to the U.S. in 2006, I had come as the leader of the Nepali delegation to the UNGA. I was the Deputy Prime Minister and Minister for Foreign Affairs then. The peace process was underway at that time. The form of the constitution was uncertain. The election to the Constituent Assembly had not been held. The monarchy was still there. The dissolved parliament had not reinstated. The parliament had exercised its authority in a strong manner. The rights enjoyed by the monarchy were taken back and the institution was brought under the constitution. The reinstated parliament had itself taken all the powers of the monarchy. The monarchy was still in existence but was in a situation of uncertainty after it ceased to be the Head of the State. It had to be legally terminated so that it would not revive. The question related to state restructuring, the peace process and the comprehensive peace accord were not decided. Ceasefire was there and there were talks of reconstituting the restored parliament. The country had entered transition but it was not settled. There was the prognosis of making a constitution which would make the people powerful. People had questions – “The Maoists have laid down arms, what will happen now?” It was a uncertain period in which answers to these questions were still awaited. Today, we have got the constitution, the republic and federalism. Three tiers of the elections have been held under federal structure. A bi-cameral legislature has been formed. The province assembly, the province governments and local bodies have been formed. Seven hundred and fifty three local level full governments and 77 district coordination committees are also in place. The Maoist has laid down its arms totally and is walking on the democratic stream in a peaceful manner. It has joined the government after managing its combatants and has united with the CPN (UML), the old party following the democratic way in a peaceful manner. There is the situation of complete change. I have a different experience in a differing setting. It is a different feeling when one becomes a partner in sharing the exceptional achievement and experience that has resulted by completing the peace process which one had run, managed and led. There is the hope and confidence to move ahead. What kind of feedbacks the meetings held with the world leaders outside of the UNGA has drawn? I held meeting with the President of Switzerland. I also met and held discussion with the Prime Minister of the UK. Furthermore, I also held bilateral meetings with the Canadian Prime Minister and Indian Minister for External Affairs Sushma Swaraj. Formal and informal meetings have been taking places on the sidelines of the ongoing UNGA. The stories relating to the peace process and democratic movements in Nepal seem to be an interesting tale to the world leaders. They seem to be happy to listen to them and have gestured that they have their support and collaboration to Nepal for in its further journey. The Colombian President has lauded Nepal’s peace process as an exemplary one. Other world leaders also have also expressed their happiness over the peace process of Nepal, political stability, wider acceptance of the constitution and the recently held three-tier elections. I have understood that they are confident that Nepal now will make strides. What would be your messages to the UNGA where you are scheduled to address tomorrow? I will present the achievements Nepal has made over the years. I will also assert that Nepal has established peace and is for the world peace, fraternity, cooperation and mutual cooperation. I will also apprise the world leaders through my speech about the new government formed in Nepal that is committed to address the issues as poverty, famine and illiteracy. Our country has friendly ties with every nation across the global. We are not foe to any countries. The leadership in Nepal will make sure its sovereignty is safeguarded while furthering mutual friendship with other countries. We are committed towards the democracy for which we fought and we are aware to further institutionalize the democracy. We should accept cooperation, investment and loans from other countries as per our needs but not on unfair conditions. We would be fair and impartial to all international issues and affairs of global concerns. I would also make the message clear that we would like to work for the greater good of country, countrymen and humankind at large. The government in Nepal will function democratic manner and public participation would be ensured in the development works. We need other friends’ support for nation-building movement, spearheading economic prosperity movement, for good-governance and achieving prosperity. We are clear about national and international policies, and we move ahead in line with the spirit of the United Nations. There is a need of the ‘Prosperous Nepal and Happy Nepali’ within the country. But how will Nepal get assistance in the divided world? The views put by the UNGA President and Secretary-General would be meaningful. The spirits of the member countries and their need were reflected in their opinions. Opinions at the UNGA would shape a subject. UNGA President’s views were in favour of social awakening. The President’s seven points put in the General Assembly indicate full democracy. Anyone could simply put their view motivated by ideological biasness. Our concerns are not with queries, but with the socialism-oriented social management. Our society should not be restricted to simply competition, political rights or other types of rights to freedom. People’s lives should be transformed as a whole. A person should be whole people. Completeness and prosperity of the society should be present in its all areas. We have a democracy, but it will be meaningless if we do not have food to eat. We need a democracy with the fundamental right of food, clothing and shelter. All these basics are reflected in the priority points given by the UNGA President. A nation maybe in different situations or have different wishes, which it can express. We want to change the current situations in which we are now. We represent a country that wishes for peace, prosperity and justice in the world. We represent only legitimate interests of the people. Fund in peace building is deducting. There is protest as well! Why protest? There would be no meaning of protesting while putting forth our views strongly in the UN, while putting views of Nepalese in front of global arena, while heading on the way to development and prosperity and while illuminating Nepal’s prestige in international community. There should be logics and reason behind the protest, the criticism should be based on a firm ground. I am neither of entertaining the protest, nor hesitated with it. People have known that the protest without logic and cause will have no meaning. Therefore, all should be aware of such things before protesting and criticizing. Matter of deducting fund for peace keeping troops! expenditure in peace keeping troops was not a greater matter however, peace is a great matter. There will be no necessary of such expenditure if the war monger was ended. Matter of discussions with Indian External Affairs Sushma Swaraj ! discussions were centred on strengthening bilateral ties. Issue of appointing permanent representatives!